There are 57 Assisted Living Facilities in the Enumclaw area, with 2 in Enumclaw and 55 nearby. The average cost of assisted living in Enumclaw is $2,550 per month. This is lower than the national median of $3,346. Cheaper nearby regions include Buckley with an average starting cost of $2,445. To help you with your search, browse the 261 reviews below for assisted living facilities in Enumclaw. On average, consumers rate assisted living in Enumclaw 4.6 out of 5 stars. Better rated regions include Buckley with an average rating of 4.9 out of 5 stars. Caring.com has helped thousands of families find high-quality senior care. To speak with one of our Family Advisors about assisted living options and costs in Enumclaw, call (855) 863-8283. Enumclaw is home to the breathtaking Mt. Ranier National Park and sits just an hour south of Seattle, Washington. The city is rich with natural tourist attractions, culture, and events and festivals happening each season. Seniors in Enumclaw seeking assisted living facilities (ALFs) have access to two within city limits, and 54 nearby. These facilities provide supervision and offer assistance with activities of daily living (ADL) such as medication management and household duties. The state of Washington’s Department of Social and Health Services provides regulations for assisted living facilities through the Aging Long-Term Support Administration. Enumclaw's cost of living is 34.20 percent higher than the national average, which may make it difficult for seniors on a budget to save for entertainment and other optional purchases. Seniors in Enumclaw can enjoy a comfortable four season climate. With an average high of 75 degrees Fahrenheit and an average low of 34 degrees, outdoorsy seniors can be active all year round. Mobility may not be an issue either, due to an annual snowfall of only five inches. Enumclaw can be considered quite safe due to its low crime rates. Violent crime is at 25.3 out of 100 (1 being the safest) which is lower than the national average of 31.1. Property crime is at 39.9, which is only a little bit higher than the national average of 38.1. Seniors may feel quite safe and secure living in this area. The Enumclaw area is home to world-class medical facilities, including St. Elizabeth Hospital, in the event of medical emergencies or illness. Due to its location outside the big city, Enumclaw has limited access to public transit. The King County Metro Transit system connects public buses, trains and waterways with Seattle and has one route through Enumclaw. The area’s dial-a-ride program DART offers accessible transit by appointment making it possible for seniors to get around town and into the major metro area. The King County area received poor air quality ratings from the American Lung Association. Ozone scored a D, and the Particle Pollution 24-hour score was a bit better at a C. Seniors with respiratory conditions or asthma should consider how this could affect their health. Assisted Living costs in Enumclaw start around $2,550 per month on average, while the nationwide average cost of assisted living is $4,000 per month, according to the latest figures from Genworth’s Cost of Care Survey. It’s important to note that assisted living rates in Enumclaw and the surrounding suburbs can vary widely based on factors such as location, the level of care needed, apartment size and the types of amenities offered at each community. 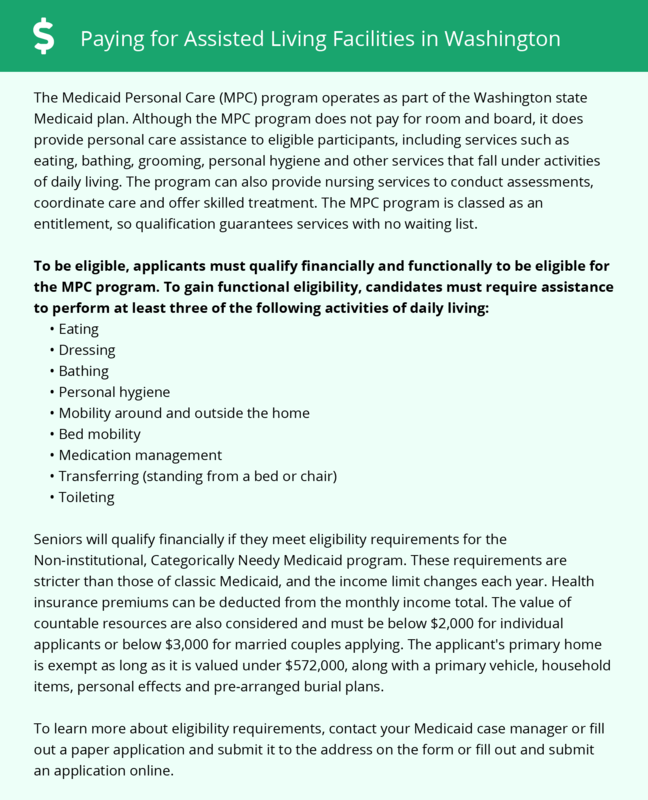 Senior residents of Washington can get help paying for assisted living through the Medicaid Personal Care (MPC) program and/or the Community First Choice Option (CFCO). While there are no non-Medicaid programs available, Medicaid recipients may also be entitled to the Washington Medicaid COPES (Community Options Program Entry System) waiver program. Enumclaw and the surrounding area are home to numerous government agencies and non-profit organizations offering help for seniors searching for or currently residing in an assisted living community. These organizations can also provide assistance in a number of other eldercare services such as geriatric care management, elder law advice, estate planning, finding home care and health and wellness programs. To see a list of free assisted living resources in Enumclaw, please visit our Assisted Living in Washington page. Enumclaw-area assisted living communities must adhere to the comprehensive set of state laws and regulations that all assisted living communities in Washington are required to follow. Visit our Assisted Living in Washington page for more information about these laws.